Abstract. Combined droughts and heatwaves are among those compound extreme events that induce severe impacts on the terrestrial biosphere and human health. A record breaking hot and dry compound event hit western Russia in summer 2010 (Russian heatwave, RHW). Events of this kind are relevant from a hydrometeorological perspective, but are also interesting from a biospheric point of view because of their impacts on ecosystems, e.g., reductions in the terrestrial carbon storage. Integrating both perspectives might facilitate our knowledge about the RHW. We revisit the RHW from both a biospheric and a hydrometeorological perspective. We apply a recently developed multivariate anomaly detection approach to a set of hydrometeorological variables, and then to multiple biospheric variables relevant to describe the RHW. One main finding is that the extreme event identified in the hydrometeorological variables leads to multidirectional responses in biospheric variables, e.g., positive and negative anomalies in gross primary production (GPP). 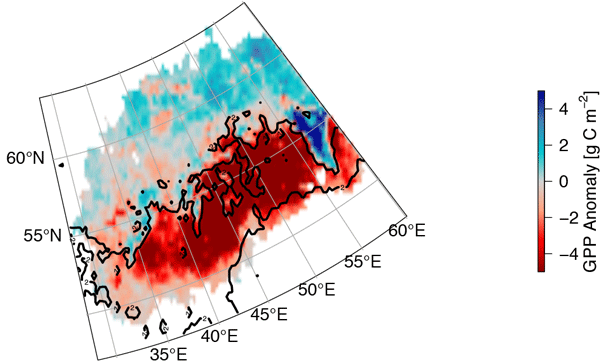 In particular, the region of reduced summer ecosystem production does not match the area identified as extreme in the hydrometeorological variables. The reason is that forest-dominated ecosystems in the higher latitudes respond with unusually high productivity to the RHW. Furthermore, the RHW was preceded by an anomalously warm spring, which leads annually integrated to a partial compensation of 54% (36% in the preceding spring, 18% in summer) of the reduced GPP in southern agriculturally dominated ecosystems. Our results show that an ecosystem-specific and multivariate perspective on extreme events can reveal multiple facets of extreme events by simultaneously integrating several data streams irrespective of impact direction and the variables' domain. Our study exemplifies the need for robust multivariate analytic approaches to detect extreme events in both hydrometeorological conditions and associated biosphere responses to fully characterize the effects of extremes, including possible compensatory effects in space and time. 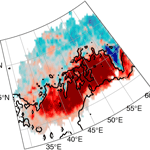 How to cite: Flach, M., Sippel, S., Gans, F., Bastos, A., Brenning, A., Reichstein, M., and Mahecha, M. D.: Contrasting biosphere responses to hydrometeorological extremes: revisiting the 2010 western Russian heatwave, Biogeosciences, 15, 6067-6085, https://doi.org/10.5194/bg-15-6067-2018, 2018.